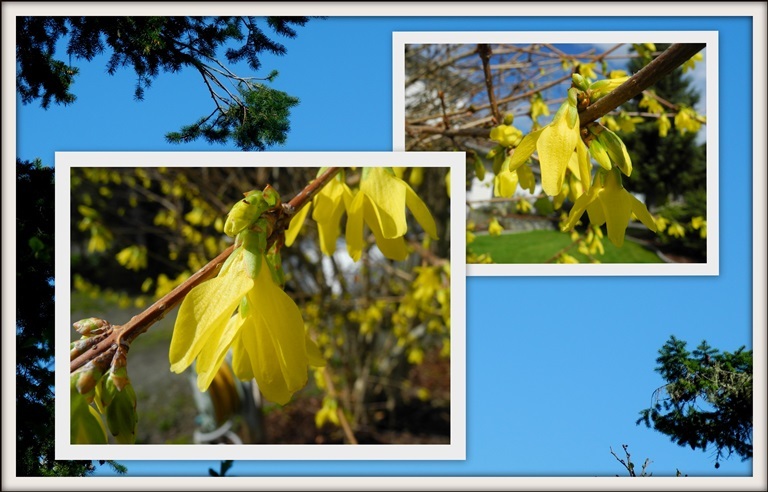 Golden forsythia is the first shrub to show colour in our garden. The cloud of yellow in the front yard is a welcome sight. Yellow against the blue sky makes is a stunning colour scheme, one of nature's best. A couple of readers have wondered how to do a mosaic featuring photos superimposed on others. Here's a quick tutorial using the downloaded version of Picasa. For those who know how to do this, skip to the bottom for more sunny yellow. Select the photos you want to use for your collage and edit them. Select and hold them together. Choose one for the background and one or two others to feature. In the create menu, choose Picture Collage. Now you can work with the photos on top. Adjust the size and angle by clicking on the center of the photo. A wheel will appear which shows the angle of the photo. Expand or contract the size by using your mouse. Using the menu on the left, add a border if you like. When you are pleased with the placement of your photos, click Create. Your collage will be created and you can then go back into your Library of photos to add a border to the entire collage, should you so choose. Lemon Bars are full of sunshiney flavours. Perfect for spring. This is my mother's recipe, a classic, found by clicking over to the link above which will take you to my recipe blog. Here it doesn't feel like spring yet, and the forsythia buds stay stubbornly shut and the sky is predominantly a dull grey. I start to feel like spring is never going to come ! I was happily looking at your forsythia blooms, thinking that my plans for the day include cutting some of my branches to force inside, when I was distracted by the closeup of the lemon bars! I bet they are delicious. It was nice of you to include a tutorial for how you create your collages. The technique you use makes for very attractive results. "Sunlit Sunday" is a little brighter for your yellow flowers and lemony delights. Thank you for participating and Happy St. Patrick's Day. I love seeing the forsythia bloom, you know spring has arrived. Always a welcomed sight! You are probably a week ahead of us, due to our bit of altitude. I can't wait to see the forsythia out here. Wasn't the sun beautiful yesterday?! My daffodils are a bright yellow and they have finally bloomed. Happy St. Patrick's Day to you. It is too soon for our forsythia bush to bloom. Thanks for the tutorial -- I'll have to bookmark this post for when I have a pocket of play-time. Ahh I love to see forsythias. They are truly the early bird and the real first sign of spring! Those lemon bars look sooo good! I love things made with lemon! I'll check out your recipe! Beautiful forsythia. I love lemon bars and thank you for the recipe. Everything is brighter with yellow! Happy Spring! Love your pretty Forsythia mosaic. I am waiting to see ours blooming. And your Lemon Bars look delicious! Thanks for sharing, have a happy week! My forsythia is in a shady spot and so blooms later. I see it all around town so hopefully mine will bloom soon. My mouth is watering over those lemon bars! The pretty yellow of the forsythia against the bright blue sky is so pretty!! I enjoy playing around with picasa and picmonkey. Thanks for stopping by - I can't take credit for the glads. those I bought at the farmers' market. I have never tried to grow them myself. I'll have to go look for the downloadable Picasa. Thanks for the guidance. Forsythia against a blue, blue sky is gorgeous. I seem to take photos of forsythia that put everyone's eyes out. Something else to think about with my photography. The lemon bars look scrumptious. Wonderful!! I love and use Picassa collage maker - sometimes I have them printed and then I frame them. I use Snapfish.com for the printing - reasonable, good color and fast shipping. I wonder if I'll see forsythia bushes here? There is so much I ahve to learn about what grows here in Colorado. Your Forsythias look so bright and cheerful and your lemon ars look delcious! Oh I'm excited to see if my forsythia has bloomed when I get home. Those bars look delicious! Yes, oh, yes! I am always waiting for my forsythia to burst forth into backyard sunshine! Too early yet, and we have yet another snow storm coming tonight and tomorrow, but I know that this is just winter winding down. Spring will be here, it always comes, as sure as morning follows night! Hope you had a lovely St. Paddy's Day! Yellow has been my favorite color since I was in high school and painted my bedroom bright yellow. Cheery photos! I love your mosaics. I always forget to use a photo for my background but I think it adds such a beautiful touch! Happy Monday! So bright & cheery...all that yellow. I still have some lemons in the fridge...and might just try those yummy looking bars.